Irritation Meditation # 5: Persecution Ain’t a Fricking Contest! As far as irritation goes, this one comes close to being a mere amusement. I am talking about a challenge issued by The Atheist Advocate, the terms of which are fairly well explained by the illustration here, and I have to admit it’s tempting to just get behind this one. Seriously, I can almost go along with it. If only I had a nickel for all the times I have seen Christians complain about petty grievances or pass along outright falsehoods about this or that attack on their faith, well I could certainly afford another nice meal on that change. Hell, the non-existent war on Christmas alone ought to earn some believers a permanent subscription to “Cry Wolf Daily” (which actually wouldn’t be a bad blog project, come to think of it). Anyway, the point is that it gets damned tiresome to hear a dominant religious majority whine about how religious minorities are oppressing them. But of course it isn’t really a dominant majority that spreads these cries of repression. Rather it is a small and highly vocal group of political Christians who would like very much to define repression of their beliefs so broadly as to include the failure to bow to their every Goddamned whim. Taken at face value, I can’t help thinking this little gambit doesn’t quite rise above the difficulties it seeks to address. This whole thing really strikes me as something of a contest over First World Problems. One would hate to run into the occasional lunatic that might make either of these T-Shirts cause for real violence. …or the occasional workplace bigot that might actually use less violent means of putting someone from the wrong camp in their place. In any event, I expect most folks here in America would probably face little other than an uncomfortable conversation or three over wearing either of these shirts. There are some definite regional exceptions to be sure (cough! …deep South! …midwest! ), but for the most part I think we are talking about a war of words. Yes, I do figure those wearing an ‘atheist’ T-Shirt will have quite a few more of those unpleasant conversations than those wearing a ‘Christian’ T-Shirt, but I am open to the possibility that I am wrong about that, and I certainly wouldn’t estimate the flack for wearing the Christian shirt to be zero. Oddly enough, I expect some of the grief given to both Christians and atheists over this sort of thing could come from the same sources. An awful lot of people seem to want to have their sin and get to heaven too, so to speak, and they can be equally testy with religious fundamentalists and non-believers alike. This ‘moderate’ bunch can be especially testy if they believe someone else has brought the issue to the table and tried to force the question, …say by advertizing their (non-)beliefs in public. That said, yes, I do think Christians are more likely to get a free pass on public expressions of their views f for no other reasn than that they have had their foot in that door for longer than those of us in the just-say-no camp. What strikes me as far more important is the fact that the list of people who have found out what ‘persecution really is’ would be unlikely to include anyone whose main worry of the day is what people will say about an ugly T-Shirt. There are people out there who face real consequences because of their belief-stances, and both atheists and theists are among them. That list also includes plenty of people who face real suffering as a result of things over which they have absolutely no control whatsoever. So, I think people should count themselves blessed if they live somewhere that you could actually play this game and expect life to continue in the wake of it. As a general rule, I think anyone who wants others to appreciate the struggles they face could do better than to start by trivializing those of others people. I also think we would all be better served if folks spent less time claiming the title of most-repressed and more time thinking about what constitutes reasonable treatment of those with whom we disagree. Oddly enough I’m not really opposed to the challenge, per se, just a certain over-billing of its significance. Still, if this leads a few of the more self-important Christians to rethink their narratives of martyrdom, then perhaps it’s a good thing. If it leads some people of either camp (or any other) to think carefully about their own bully-triggers and what we can do to help those under the gun for such things, so much the better. Great post! thought provoking AND interesting. I have a problem with the religious right bullying people but at the same time many of the people I love and respect are christians. Its lead to some great conversations. It’s the same for me, some awkward conversations too, and even some nasty ones, but some very good ones. A lot depends on the particulars. I agree the conflict between atheists and Christians needs to move past the point of who is prosecuted more. It’s much the same as throwing Hitler back and forth. Oh, he belongs to the atheists, no, the Christians raised him. The point is moot. What really matters is that we encourage separation of church and state, and that separation continues to education. Hm. I started thinking about the not-so-separated church and state/ education, and my heart plummeted and I silently wept for the grown-up children who believe all virtue comes from the Bible, and cannot exist without it. Back to the T-shirts, just briefly, being Australian I think you’d get a funny look regardless of which one was worn. Personal belief typically isn’t advertised here and no big deal is made about it; no one really cares. However, that lack of caring has led to a trickle-down creep of American religious ideals into our less tolerant population. It’s always the homophobic and xenophobic who latch onto religion. Is religion the reason or the excuse for the fear? Perhaps that, more than anything else, is what needs to be addressed in a healthy debate. I think I’ve met some very open and caring believers in my day, but I often have a sense that some people’s contempt for various people saturates their faith to the degree that I don’t regard it as a simple mistake. For some you can’t help but think it’s their payoff. It’s what they get out of God, leverage over someone they never liked to begin with. It’s a shame if that is appearing more in your country; it;’s prevalence here doesn’t speak well for America. It’s nice to see someone with a sense of perspective on the issue. I hope you can help the Coptic church members. On the subject of religion in America, I thought “Founding Faith” by Steven Waldman to be terrific. It dispels the myth of religious freedom in the colonies. Rather, it convincingly demonstrates that people came to North America in order to impose their religious beliefs on others. That has been my own take on the subject ever since I first started taking history classes. I am continually amazed that people could describe the Puritans as having any interest in religious freedom whatsoever. That’s just pure anachronism. This makes me think about the years I spent breastfeeding in public. Any public expression in support of anything even slightly controversial is bound to get some disgusted looks, some high-fives, and a conversation or two. Some of those conversations will be positive, others negative. Short of someone coming up and assaulting you, whether verbally or physically, I don’t really think anyone is being persecuted. People disagreeing and having the freedom to say so is integral to a liberated society. Being in the minority of any issue is difficult. I wish polite conversation was more likely than being cursed at from afar but I’m with you on this one. Crying persecution is less likely to enlighten someone than actually showing them any one of the many examples of atheists being oppressed. Thank you for the comment, Muggle. It appears we are on about the same page, I think for this one. I wore a “Teach the Controvesy” shirt with a stork carrying a baby to the hospital when my twins were born. I had to explain it when questioned by nurses…they were not amused. Your blog looks interesting, and I’ve become your latest follower. As a lifelong atheist (actually everyone is born an atheist so it’s not much of a declaration), I was definitely taken in by this post. I respect your point on this one, and certainly part of the price of living in a democracy is putting up with hearing opinions we don’t like. However, I think that the prejudice against atheists in the U.S. incites more than unfriendly conversations, and it seems unfair to dismiss it. Judging from the ways that I’ve been treated when occasionally coming out to co-workers as atheist (in one case one has refused to even look at me or greet me for months unless absolutely necessary), it’s reasonable that being openly atheist – or even just saying you don’t attend church – could realistically threaten your employment in some areas. I’m absolutely certain that there are people who would no longer associate with me, let alone serve as references, if they found out I was an atheist. These sorts of subtle social means of silencing us may look benign but they can be deadly, stripping us of our economic and social dignity. Unfortunately, we do not live in a rational culture where religious people just go about their silly rituals and leave their faith out of everything else (like our schools, our currency, our politics, etc.). Faith is considered a value by most, and being rational is only valued up to the extent that reason is abused and distorted to support sick “family values” and bigotry. In that type of culture, people like you and me have to be careful. That being said, it is important to stand up to faith-based bigotry everywhere. The U.S. is no Bangladesh, but certainly neither is it Estonia (fewest religious people of any country in the world) or France (most atheists of any country in the world; FYI the discrepancy is that Estonia has more “spiritual” folks who aren’t strictly religious than France does, apparently). My point is, there is unnecessary suffering for our non-belief, and our country can do better. Thank you for your reply. I’ve been thinking about it over the last week and I thought I would take a crack at responding. I suspect we may be closer to agreeing than it sounds, though I also suspect that may not be much comfort depending on how the conversation goes. Here’s hoping for a productive dialogue. First I would like to say that I do agree that prejudice against atheists can lead to more than unpleasant conversation, and I do believe that i acknowledged that in my original post. I do think though with some regional exceptions, those are the exception rather than the rule. I also think they could well fall on quite a few believers too, including some mainstream sects if they happen to be in the wrong area. I have had coworkers who stopped talking to me when I told them i was an atheist, and I too realize I could lose potential references, etc. For the record, I live in a town of about 4k people with roughly 10 churches. Nearly everyone I work with is a believer, and many of them are not used to dealing with non-believers. The threat is real to me. I don’t hide my lack of belief and I am prepared to contest any demonstrable discrimination that may be directed at me. I am certainly not suggesting either that discrimination does not occur or that one should not stand one’s ground when it does. 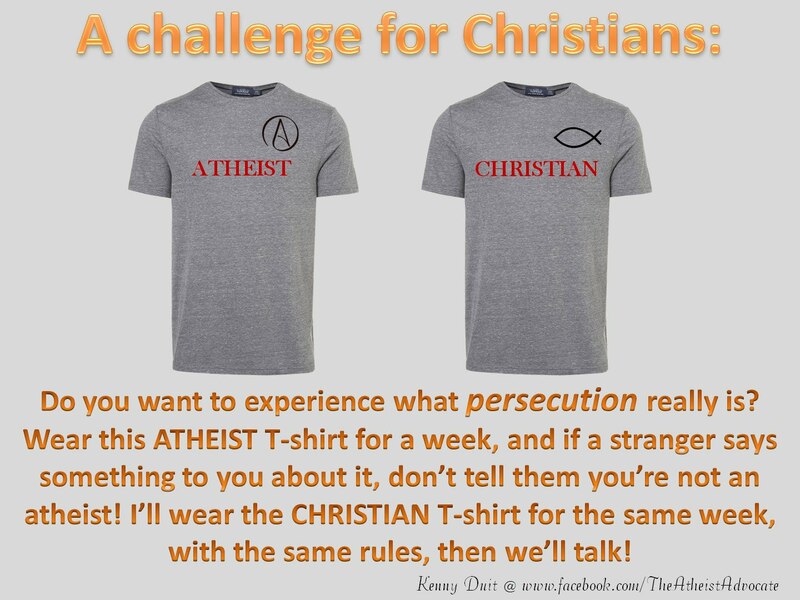 What I object to in the T-Shirt really is the one phrase about seeing what persecution really is, and I do so precisely because I want to keep in mind that the sort of battles we fight with Theists in America are (with some exceptions) on a scale far below that faced by many minorities (intellectual or otherwise). You (and the author of the challenge) are both clearly aware of such things and do good work fighting such persecution where it occurs. What I object to in this instance is the hyperbole. I just have a hard time thinking of the sorts of discrimination we might face here as real persecution while knowing that people are in prison elsewhere (in some cases facing execution) for their faith or the lack of it. If we are to speak of anyone as facing real persecution, I think it is such people. There is at least one positive implication to my concern, and that is the sense that because most of the discrimination we face does consist of talking, that makes it manageable. I don’t mean that the outcome will always be good,or that it is easy, but merely that one has a fighting chance of handling coworkers who may freak out when say you decline to deliver the opening prayer at an official graduation dinner (this happened to me) or of overcoming potential discrimination on the job. Once again, I am inclined to think the sort of persecution suggested in the language of the challenge ought to be reserved for those who don’t even have that sort of chance. Thanks for such a thoughtful and reasonable discussion! I think as you said that we are actually more in agreement than not, perhaps only with minor differences of opinion about the severity of things. I couldn’t help but think – THIS is what happens when extremely reason-based people encounter disagreement: a rational discussion with a basic level of respect for the other individuals involved. I think he adds the perfect note to our discussion on persecution. An interesting post. I’m a Christian and sometimes wear a “Not ashamed” T Shirt. Of course I forget I’m wearing it, but i has only ever sparked good conversations. What fascinates me about this challenge is would Christian’s use the “trigger” to strike up a conversation with an atheist? What I find even more amusing is the fact that Atheists say they don’t believe in God but feel so zealous in sharing their view. If there’s no God why not just feel comfortable with that, and leave the rest of us to our own devices? Even more fascinating is the fact that secular historians say Jesus did exist, did miracles, and so on. As for me if folk don’t want to believe, that’s fine by me. I disagree with a number of your observations at the end, Snow, but I’ll leave that for another day. I do think you raise an interesting question about whether or not Christians might use the T-Shirt to strike up a conversation (as opposed to persecuting the one wearing it). One would hope that folks would either do that or leave it entirely alone as opposed to getting aggressive about the issue, and I suspect that a lot of people would. I have been abused because I was visibly queer. But in Britain, I think the noticing of the T shirt would be that someone had made such a show of it, rather than that the person was atheist or Christian. Live and let live, quietly, we say. I do think that would at least be part of the issue. People tend to react strongly to the perception that someone else is pushing the point. Frankly, I think such reactions are pathetic, but I still wouldn’t equate that with real persecution, per se. I think I would be more inclined to start using such phrasing when you don’t hav to raise the issue yourself, …i.e. in cases when others come after you for simply looking the part (or some comparable form of inference). True enough, but I do think the relationship between the views people express in such polls and their actual behavior is rather complex. While atheists appear to be an object of great contempt in that study, it does not appear that we are subjected to high levels of direct attack. We don’t seem to get the same level of flack that homosexuals and muslims do, and while the indicators for prejudice may rival those of rapists, I don’t think people actually treat atheists they way they treat known rapists. Which is part of the problem I am trying to get at, I think the rancor on this issue is amplified by the debate between believers and unbelievers. It isn’t entirely absent in other contexts, but it’s easy to over-estimate the level of discrimination and violence when viewed through the lens of an active proponent in the debate, …which is why I think the language of the challenge reflects a bit of confirmation bias. That is a classic statement. Great post! Interesting post and discussion. Makes me consider other beliefs that we ‘advertise’ through t-shirts, bumper stickers, etc. Good post to open some stubborn minds. Appreciate your points. Would not bring up the courage to wear the “wrong” T-Shirt. But I would consider this is not only a matter of belief but of betrayal of the community you live in. Everybody feels better in a group of alike minded. So lets not narrow the problem down to belief. D you’re a clear thinker and a great writer. In fact, I don’t plan to debate at all. But it is pretty late and I’m pretty tired so I’m going to just catch some z’s without saying anything profound, except the suggestion that I’m not seeing how the “God herself” fits too good in the overall rationale. I definitely appreciate your writing skills and your logic/reasoning. Your logic is right on. If I were logical it would convert me. But I’m just tired, so can I just have the Christian T-shirt and we’ll try again on another post? thanks, and I do like your blog. Thanks for the like NLI. I hope you got some sleep. I haven’t had any myself for a few weeks.